UPDATE: THIS GIVEAWAY IS NOW CLOSED! Winner: Kim, Congratulations! Win SwaddleDesigns Ultimate Receiving Blanket®! Designed by a registered nurse, this super soft and larger than the typical receiving blanket will make a wonderful gift for any new mom. Every baby will feel safe and loved snuggled up in this preshrunk 100% cotton flannel. To enter just visit Swaddle Designs and tell us which Ultimate Receiving Blanket you would choose if you win. Click here to earn extra entries! I would choose the certified organic pastel pink mod circles on ivory. I follow Swaddle Designs on facebook. I follow Swaddle Designs on Twitter. I love the dots and suns yellow, sooo cute!! I would choose the pastel lime with brown circle design. I love the mod on white line, pastel pink! I'd pick solid lime with brown dots! Love these! I like the Certified Organic blanket. I like the ivory and cream trim. I'd choose the Pastel Lime with Brown Circle on Circle. Thanks! 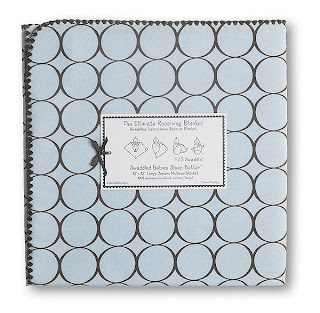 The SD-068PB Ultimate Receiving Blanket Certified Organic Pastel Blue Dot & Stars on Ivory would be my pick. Good luck to all. I entered using your Google Account Identity entry/post comment method. I became a Facebook Fan today. Extra entry 1. Following via Google Friends Connect. Extra entry 2. I found you via OLS New Sweeps. I would choose the Dots & Suns - Yellow. I follow @SwaddleDesigns on Twitter. I got to your site through Deal Seeking Mom. I like the very light pink with pastel polka dots. I got to your site through The Motherload. I totally choose the natural organics with sage trim. I'm a sucker for sage. love the Corner detail sage one! Red little stars is my favorite! I like the navy trim with dots and stars. Thanks for the chance. I love the baby cheetah print! I follow you on Twitter as annaed2. I'm your fan on fb. I made a purchase from an event sponsor - Blush! I love the look of these blankets! I would choose the ultimate receiving blanket in mod on white with pink pastel! I am your fan on facebook. I first found you through etsy giveaways blog. Um, I would choose the pastel blue with Mad Brown Circles. SwaddleDesigns - Ultimate Receiving Blanket - Very Light Blue with Pastel Blue Dots, please, They look soft and cuddelly. I like the navy stars the best. I like the baby luvie in bright yellow ~ my sister has the green polka dots swaddle blanket and adores it. I like the Red Little Stars Receiving Blanket. I really like the pastel pink fussy with satin trim. I love the bright yellow polka dots blanket! Thank you! SwaddleDesigns - Organic Ultimate Receiving Blanket - Kiwi Mod Circles on Ivory. So cute! I found your site on Free Blog giveaways.com. I really like the Baby Cheetah design. Thanks! I love the polka dot black. It would be perfect for our nursery colors. Thanks! I like the solid pastel lime with large circles. Thanks - these look so soft! The Dots & Stars Navy is my favorite, it would be perfect for my cousin's baby shower in a few weeks. I came here originally from Prizey! Little navy stars look so cute. These are great blankets! I would pick the dots & Suns yellow. Thanks! I'd choose the Natural Organic Receiving Blanket with Sage trim. I would choose the natural organic in cream. Thanks! I like the pastel pink w/ brown circles. I would pick the pastel lime with brown circle design. Thanks for the contest! I would pick the Dots & Hearts in Fuchsia. Another favorite design would be the "Dots & Hearts-Fuchsia", sooooo dang adorable & would be great for the lil one that is coming in February! I'd love the pretty Little Hearts Fuchsia one! I love the Baby Cheetah! My favorite is the Pastel Pink with Brown Dots SD-014PP. I'm following you on Twitter user lislamg. I'm also subscribed to your feed in google. I'm a friend on Facebook user Lisa Garner. I'm following SwaddleDesigns on Twitter user lisalmg. I'm also a Facebook fan of Swaddle Designs user Lisa Garner. Let's go with the lime with brown dots. Following the brown couch on twitter as ky2here. I've fallen in love with the "Fresh Pastels in Kiwi." It is absolutately adorable. My son is nine months and I still use a swaddler with him at nap time. The polka dot black one. I am loving the SwaddleDesigns - Ultimate Receiving Blanket - Very Light Kiwi with Pastel Kiwi Dots. Thanks for the chance! I subscriber via google reader. I'm a friend on FB. I would love the baby cheetah design! Thanks! I'm a fan of you on facebook! Sheila H.
I found your site from OLS! I'm a fan of them on facebook! Sheila H.
I'd pick the pastel green with brown mod squares. Adorable! GOT TO YOUR SITE VIA ONLINE SWEEPS. The mod circle organic is my favorite. I would like the red little stars. I got here from online sweepstakes.com. I would love to win this! I really like the black polka dots. Thanks! They're all so cute. I would pick the polka dots in black.